Over the past ten years, snowmobile use has skyrocketed nationwide in park areas, thanks to a new generation of more powerful machines suited to the challenging terrain. During the winter of 1999, the National Park Service began considering how to deal with a rapid increase in snowmobile visitation at Yellowstone and Grand Teton National Parks. 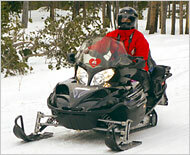 By spring of 2000, a gradual phase-out of snowmobiles in Yellowstone was ordered, to take place by the winter of 2002-3. Snowmobile enthusiasts and the Jackson Hole Chamber of Commerce took exception, and a suit was filed to block the change. On June 29, 2001, the Bush Administration suspended the new rules, calling for a Supplemental Evironmental Impact Statement that took into account the changes that may take place upon the introduction of a new generation of quieter, cleaner snowmobiles. A revised rule was released by the Bush administration in 2003, allowing 1100 snowmobiles a day, with 80% being part of guided tours. This revised plan met with legal resistance, and during 2004 dueling Federal Courts in Wyoming and DC threw out both the Clinton and Bush plans, respectively. The Park Service responded in the fall of 2004 with a temporary 3-year plan, which allowed 720 snowmobiles a day, all required to be part of guided tours, and initiated a new EIS process in the hopes of generating a long-term Winter Use Plan. The third "final" plan was released in March 2007, settling on 540 snowmobiles a day, and again, requiring all to be part of guided tours. Ever since the establishment of the "guided-tour-only" requirement, total snowmobile use in Yellowstone has declined dramatically. From an average of 840 machines per day (with peak weekend totals of 1600-2000), daily averages have fallen to 263 since 2004, when the tour requirement took effect. Meanwhile, snowcoach ridership has nearly doubled. Still, sound monitoring has found that vehicles were audible over half the day in many popular areas, including at Old Faithful 68% of the time, and 59% of the time at Madison Junction. 9/08: (scratch that previous entry)....Third Yellowstone Snowmobile Plan Tossed by Federal Court - The eternal cycle of Yellowstone "Winter Use Plans" looks to continue for at least one more round, as the third final National Park Service rule governing snowmobile access to Yellowstone and Grand Teton National Parks has been tossed out by a Federal District Court after challenges form a consortium of environmental organizations. Related: Greenie Gives Current Snowmobile Usage Thumbs Up - A letter from Larry Cline, published in the 4/4/05 High Country News: "...as an ardent greenie and retired employee of the Dept of Interior, I must admit the new (snowmobile) rules are a good compromise. . . No more private machines screaming along the roads at breakneck speeds, as I was told by a snowcoach driver. No more park employees at the gates wearing gas masks. 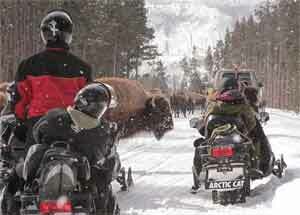 And everyone, even snowmobilers, slows way down for bison on the roads. Yes, one can hear them for a moment, if you are on a roadway as a group goes by. But while on the ski trails one can seldom hear them. So let's let by-gones be by-gones and simply enjoy the park: it is there for all of us."